One of the world's largest consumer drone makers says it's concerned hobbyists will face tougher restrictions over where they can fly if Amazon and Google get their way in creating dedicated airspace zones for commercial flight. Currently, both companies face restrictions over operating such a service under Federal Aviation Administration rules that restrict almost all commercial flight, but they are both pushing for the rules to be rewritten as soon as possible. 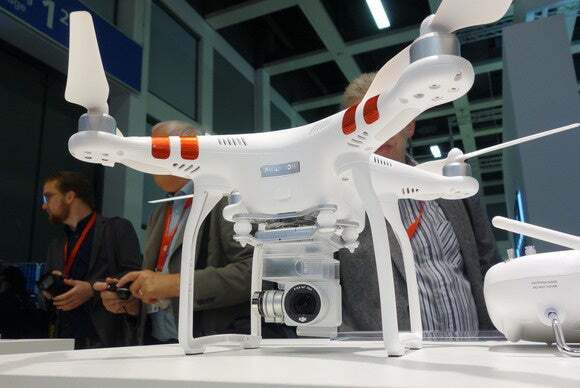 "Some of the proposals that have come onto the table start capping the amount of airspace that hobby users have," said Michael Perry, a spokesman for DJI, which makes the popular Phantom drone series that is popular among hobbyists for aerial photography. Perry was referring to proposals made in late July by Amazon and Google at a drone conference in Moffett Field, California. Amazon put forward the idea of a high-speed drone zone between 200 and 400 feet altitude that would be solely for drones under automatic control. Google proposed that all airspace under 500 feet be reserved for drones with transponders that continually broadcast their location and take orders from a computerized air traffic control system. Both would impose tough new restrictions on hobbyists. The Amazon proposal would cut by more than half the airspace available to them while the Google proposal would all but eliminate manually controlled flight. "We feel that unfairly penalizes some of the people that actually put forward this technology, that started developing the innovative potential of the technology," said Perry. "So we hope that any regulationss that come on board don’t unfairly penalize the people who made the industry what it is today." Typically, drones in the U.S. can by flown today by hobbyists under similar rules for model aircraft. They should remain under 500 feet, which is where controlled airspace begins, and stay 5 miles away from airports. They also have to be within sight of the operator. The FAA is currently examining the rules and hearing proposals from companies that would allow commercial use. Final rules are expected sometime in 2016 or 2017.